“In great deeds something abides. On great fields something stays. For Civil War buffs in general, and those interested in the paranormal aspects of the Late Unpleasantness in particular, Gettysburg, Pennsylvania is something akin to Mecca. The site of the most famous battle of the Civil War. For generations it has attracted both Civil War enthusiasts and average tourists by the millions. Compounded by its fame as a battlefield is its connection with Abraham Lincoln and his most famous speech, the Gettysburg Address. Certainly, just for the history alone, Gettysburg is worth visiting, especially in this sesquicentennial—and even more this year, the 150th anniversary of both the battle and Lincoln’s speech. Having written about both Gettysburg’s restless dead and Abraham Lincoln’s own fascination with the paranormal, I would be remiss if I did not devote at least one blog entry to this holy grail of re-enactors, ghost hunters, and mainstream Civil War historians alike. Col. Chamberlain and the 20th Maine charging the enemy at Little Round Top. Did they have an assist from the ghost of George Washington? In Ghosts and Haunts of the Civil War I chronicled a few of Gettysburg’s haunted locations; one is connected with Colonel Chamberlain and his famous defense of Little Round Top and another section deals with the phantoms of Farnsworth House. Farnsworth House is on most top ten lists of haunted hotels and what it lacks in size it makes up for in sheer volume of paranormal activity. They offer ghost tours and have even added a re-enactment of a Civil War era séance–of the sort which both President and Mrs. Lincoln attended. For more on the Lincolns and Spiritualism, see Chapters 14 and 15 of The Paranormal Presidency of Abraham Lincoln. Both President and Mrs. Lincoln attended séances while in the White House. At Farnsworth House they re-enact that sort of nineteenth century session. I could easily have filled the whole book with other Gettysburg spirits and encounters, but to be honest that field has been amply plowed by Alan Nesbitt and his series of pamphlets covering them. Alan was a tour guide at Gettysburg for years and collected a number of first hand accounts, as well as being knowledgeable about the battle itself. Greystone Productions, with whom I collaborated on the production of their video Ghosts of Music City, has also produced some a nice series of documentary videos on the subject as well; in fact they too have a store in Gettysburg. So why add to the congestion? 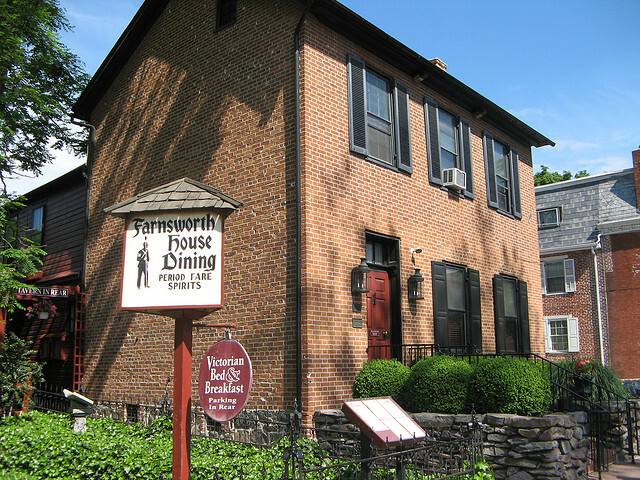 The Farnsworth Inn and B&B generally makes the top 10 lists of most haunted hotels. See Chapter 15 of Ghosts and Haunts of the Civil War. Well, it just so happens my daughter visited there last summer, while en route to attend a friend’s wedding. Like many visitors, she snapped several photos of her visit. Surprisingly, (or perhaps not so surprisingly) when she viewed a few of them later she saw some weird things had appeared on the digital shots. In one photo, taken at night but without a flash, she caught what definitely appears to be a gray apparition looking out of an upstairs window in the town. Unfortunately, whenever we have tried to enlarge it to make it more distinct, the autocorrect function in the digital camera kept trying to erase the image: so much for the wonders of technology. The image remains on the original, however. She also took a series of shots looking out over the battlefield in the dark. Standing in one place, she took an overlapping sequence of them to form a panorama. To be honest, in nighttime there is little of the battlefield to see; what was interesting, however was that in several of the shots there appeared a cluster of white “orbs.” Now anyone familiar with both the paranormal and photography is familiar with this phenomena; orbs are thought to be a particular form of ghostly energy not normally visible to the naked eye; debunkers claim it is just dust reflecting back the light of a flash at night. Well, these photos were taken with low level light-sensitive camera; more importantly they were all taken from the same identical position, yet some photos had orbs, yet others didn’t. If it had simply been dust in front of the lens then all the photos should have come out exactly the same: they didn’t. Many, many other visitors to Gettysburg report similar strange encounters, some far more dramatic than my daughter’s. Far more about Gettysburg ghosts, see chapters 15 & 16 of Ghosts and Haunts of the Civil War; on Lincoln and the paranormal, see my brand new book, The Paranormal Presidency of Abraham Lincoln. Ghosts and Haunts of the Civil War, Chronicles unexplained phenomena connected with the Late Unpleasantness in the battlefields and houses where the conflict to take place. The Paranormal Presidency documents for the first time many of the reports about Lincoln’s belief and practice regarding the Unexplained and Uncanny.